✉ Have a question about this part? Email us! If not in stock; usually ships in 2 days. Please start by selecting your Vehicle above. If you know our part number click here. 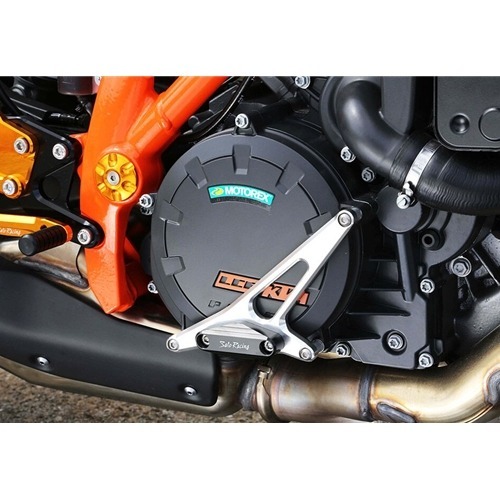 Sato Racing [R]-side Engine Slider for 1290 Super Duke R helps protect the engine clutch case and surrounding parts from scrapes and other damage if you lay it down on the track. Sturdy anodized billet aluminum mounting bracket with a tough, abrasion-resistant Delrin Slider plate, securely attached to the engine case with aluminum collars and stainless steel bolts. Sato Racing is a boutique manufacturer of unique specialty parts for sport bikes. Sato Racing known for their premium quality lightweight Rear Sets, Delrin-based Frame and Axle Sliders, and Racing Hooks are all designed and manufactured at their state-of-the-art production facility in Osaka, Japan. Sato Racing’s in-house design and limited production scale contributes to a high quality handcrafted feel, and allows them the flexibility to quickly develop and offer parts for relatively rare bike models that other aftermarket parts makers tend to overlook. Providing high performance aftermarket motorcycle parts since 1973.